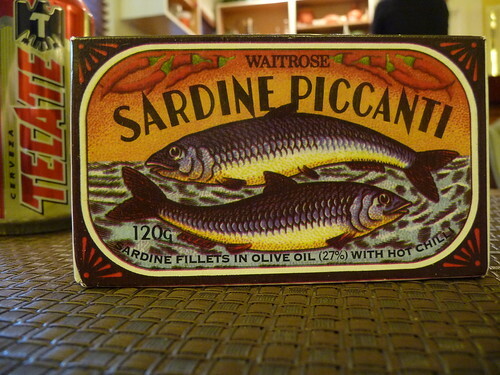 Sardina Pilchardus Walbaum is in the ingredients. That, olive oil (27%), sea salt, and chili peppers are all that's in this tin. I found two small chili peppers, With Seeds, in the bottom. I love finding bits. These are the third tin smuggled in from England, Europe. Not quite three large fish, boned and skinned. The oil tastes clean and spicy. There is a nice heat here, it lingers, I like it. The meat is very lean and dense, it doesn't melt in your mouth like a fatter fish might. It seems like a perfect luncheon meat. 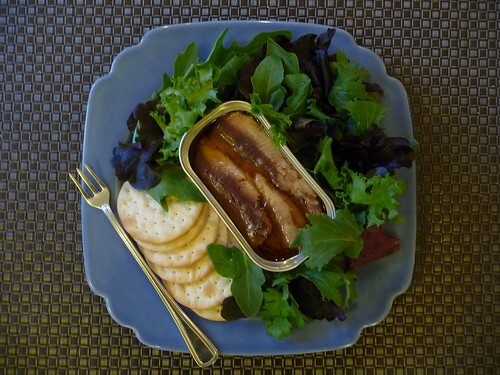 Great for a sardine sandwich, baguette, greens, and a lighter luncheon style beer. Bag of crisps. This fish is Alberto Contador; Spicy, Lean, Dense, Smart, Fast and Furious. Fork, courtesy of Chez Panisse, they served it with a side of anchovies. Oh, on a side note, I have turned all the tins in the pantry upside down, thinking they have spent most of their lives right side up, on display, or in cases on pallets, etc. Let the oils saturate the other side. Contador is only three tins? The King has an obvious bias toward French riders and/or names. Where is Fausto Coppi for insistence? or Bartalli? (who are certainly ahead of Contador, inspite of my hasty list - unless time proves otherwise.) Alberto has an attacking, rather than calculating heart. Contact or Contribute, if you want. Do a good job and we might put it on here, but no promises, okay?